WinSoft provides the industry’s highest quality of custom automated test and measurement solutions for the Aerospace, Industrial, Commercial and Military markets. Our quality policy begins with an uncompromising commitment to excellence within the engineering and design process and continues throughout the manufacturing cycle to post installation service and support. This emphasis on customer satisfaction during the life-cycle of all projects translates to reduced life-cycle cost and increased value. We focuse on customers’ requirements to create cost effective, quality products and to deliver products on time. We accomplish this in a structured environment using formalized quality processes and by trained employees. WinSoft is committed to complying with applicable statutory and regulatory requirements and seek to continually improve our products, services, and Quality Management System. Our global reputation for quality and reliability has earned the company major recognition within companies such as Raytheon, Boeing, Lockheed Martin and Northrop Grumman: 100% QA Rating and 100% delivery on time which benefits our other communications, automotive, industrial, OEM, military, and government programs worldwide. 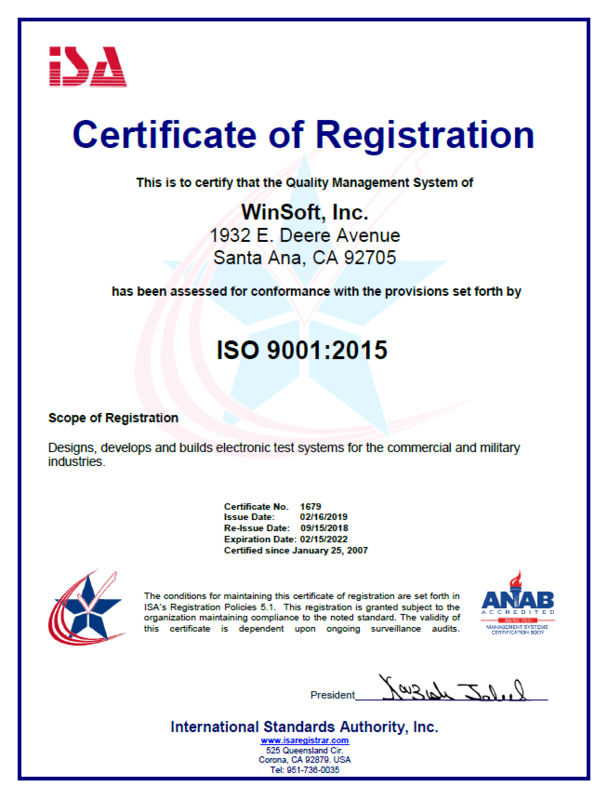 Our quality program has been audited and certified to comply with ANSI/ ASQ ISO 9001:2008. WinSoft quality system includes a continuous improvement program that utilizes information and suggestions provided by employees, suppliers, and customers to continuously improve products and processes on an on-going basis. Copyright © 1994-2018, WinSoft Inc. All rights reserved. WinSoft® is a Registered Trademark of WinSoft Inc.
All other TM used on this site are the property of their respective owners.